USD has been under pressure because of last week’s comments from Fed officials but Italy – German bond yield gap is preventing EUR from further growth. 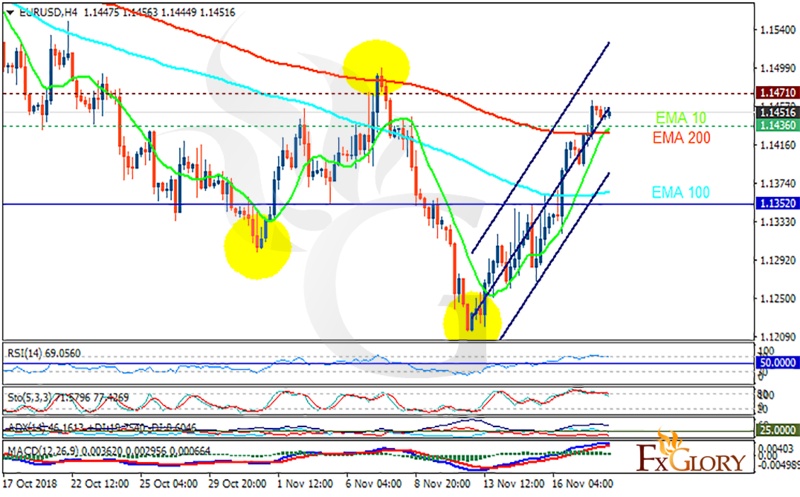 The support rests at 1.14360 with resistance at 1.14710 which both lines are above the weekly pivot point at 1.13520. The EMA of 10 is moving with bullish bias in the ascendant channel and it is above the EMA of 100 and the EMA of 200. The RSI is moving in overbought area, the Stochastic is moving in high ranges and the MACD line is above the signal line in the positive territory. The ADX is showing buy signal. Today there is a high probability that the pair grows towards 1.15.